Alex Schweder and Ward Shelley's "Reactor" - Archpaper.com Alex Schweder and Ward Shelley's "Reactor"
At the end of July, in a field in the middle of the Hudson Valley, this precarious house twisted and tilted for five days while its creators lived inside. The house is called Reactor and it’s the latest from collaborators Alex Schweder and Ward Shelley. Schweder and Shelley told The New York Times their work is “performance architecture,” a name that reflects their philosophy of building interesting structures and then living in them. Reactor was built at the Omi International Arts Center in Ghent, New York, with dimensions of 40-by-8 feet balanced on a concrete pillar. As Schweder and Shelley lived in the space, both the wind and their own movements kept it in perpetual motion. As breezes spun the structure around the center, it would tilt up and down as the pair moved into the building’s different rooms and changed its center of gravity. The installation has similar themes to the pair’s previous works which involve a pair cohabiting an unusual space that requires teamwork to get around. 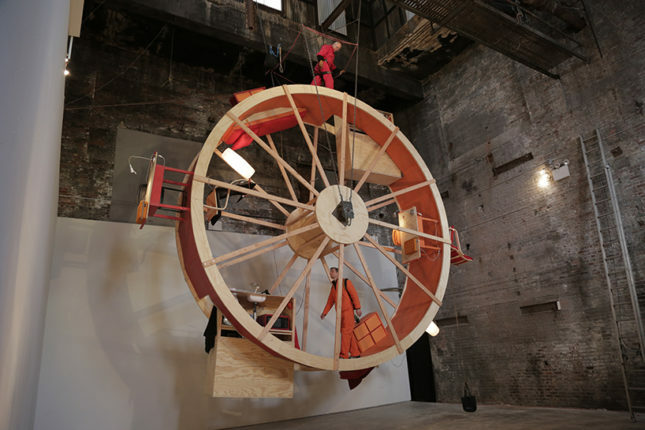 For example Orbit from 2013 resembles a giant hamster wheel, with one artist living on top and another living inside the circle. Counterweight Roommate from 2011 had the two attached to each other on opposite sides of a vertical structure, so that for one to go up the other had to go down. Shelley and Schweder shared their journal entries from the first few days of living in Reactor with The New York Times. In them they express the irregularity of the weather and movement patterns in the house, and the calming effects of being in constant motion. They also shared the sense of being intimately aware of your roommate’s presence, as the ground under your feet moves with them as well. The house will be on display at the Omi International Arts Center for two years. Scheweder and Shelley will return to spend more time in Reactor for several days in September and October.